All Day Energy Greens - 100% natural drink mix superfood supercharged with vitamin A, vitamin C, vitamin E and energy supporting herbs. All Day Energy Greens energizes your body and immune system to give your body an INSTANT energy boost that lasts all day. OsteoHA (formerly Alleviate) - Living with joint, arthritis and muscle pain? OsteoHA is a natural anti-inflammatory supplement that helps to restore synovial fluid in joints and prevent further joint damage. Also reduces pain caused by inflammation and improves over all joint health and muscle flexibility. Gluco Harmony - Designed to help improve your insulin response in your body, Gluco Harmony, helps you maintain normal blood sugar levels. Contains 9 Ayurvedic herbs and spices including shilajit, curcumin, bitter melon, fenugreek, and banaba to help reduce your risk of problems associated with diabetes. Natto BP Plus - Combines all natural, high quality ingredients to help lower high blood pressure. The heart vitamins and minerals found in Natto BP Plus™ include Nattokinase, Acetyl L-Carnitine, Cranberry Extract, Bonito Peptide, Celery Seed. Second Wind - 9 all-natural ingredients help protect and repair your respiratory system gives your lungs the protection they need with Second Wind™ Respiratory Rescue Formula. Cleanse, protect, and fortify your lungs with the right nutrients, such as those found in IVL's Second Wind herbal lung health formula. Reconnect - Do you suffer from Tinnitus, ringing in the ear? Reconnect™ is a combination of supplements and herbs that support your hearing at the cellular level. Focusing on replenishing any nutrient deficiencies to offset the loss of cells associated with aging. Secretagogue - Help fight off the signs of aging with this fizzy drink mix available in Orange / Raspberry Lemonade flavors. Secretagogue's proprietary blend of amino acids and precursor nutrients supports immune function, decreases body fat, increases muscle mass and blood supply to the ventricles. Go Ruby Go! - In one shake, you get concentrated fruit extracts with 42 purifiers, detoxifiers, cleansers, and energizers packed into this powerful fruity meal replacement. Go Ruby Go! has amazing antioxidants, energizing herbs, vitamins and more are packed into a superfood meal on the go. Green Tea Elixir - A convenient sweet tasting mixture that gives you added life-sustaining essentials. Get the benefits of 20 cups of green tea by using Green Tea Elixir drops in your favorite cold or hot drink. Give your immune system a boost with the added advantage of lower blood pressure with this potent elixer. Vision Clear - Improve your eyesight naturally. 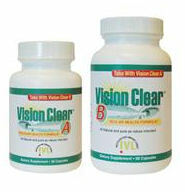 Vision Clear is a unique formula offering high potency anti-oxidants, omega-3 fish oil, alpha-lipoid acid, and other powerful eye nutrients in a two-step supplement. Give your eyes the right amount of nutrition with the most successful bioavailable formula. Berry Essentials - A tasty blend of 10 dark berries provides nature’s most potent, disease-fighting antioxidants with no sugar, corn syrup, or artificial flavoring. Unlike many nutritional supplements, you and your family can drink as much Berry Essentials as you want. SeaNU Hair - The revolutionary formula in this supplement even acts as an antioxidant and protects your scalp cells from free-radical damage! Q-Hydrate528 - Cleansing and detox liquid vitamin mineral supplement formula. These products have been discontinued. Super Wheatgrass Combo - 100% organic Wheatgrass, Barley Grass and Lemon Grass stimulates enzyme production for improved overall GI track health by scrubbing your intestinal track. Super Wheatgrass Combo provides better nutrient distribution to your bloodstream and helps eliminate fat and inches. 100% Money-Back Guarantee - If you are not satisfied with your purchase, you may return it for a full refund.